Check Here, The Collection Of PadMan Movie On It’s Second Day. Padman movie is a great step in the support of feminism. This movie is surely going to break some stereotypes. As soon as it was announced that a movie on such critical issue is going to be made, people were eagerly waiting for it. And it didn’t fail to stand up at our expectations. 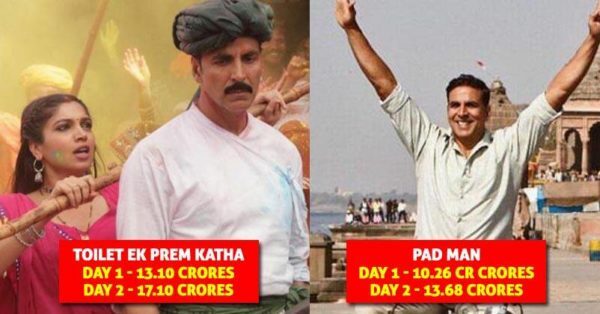 The movie did a good collection on its first day and the results of the second-day collection are out. The movie earned 10.26 Crore on its opening day. The results could be better but this is also cannot be considered as bad. But it made a comeback on its second day. It earned a good amount of 13. 68 Crores on its second-day which is a good sign for a movie. So the total collection of the movie becomes 23.94 crores. The movie Padman is inspired by a real-life story which is portrayed on the big screen with the help of Akshay Kumar, Sonam Kapoor, and Radhika Apte. In this movie, Akshay Kumar is playing the lead role and Radhika Apte is playing the role of his wife. The movie is directed by R. Balki and is getting a positive response from a lot of people even though it is made on a sensitive issue which is considered as a taboo in India. It is a very good thing are people are supporting it and giving positive feedbacks. People were also seen promoting the movie and the motive behind it by clicking a selfie while holding a pad. Even the celebrities were seen promoting the movie and pad by holding it and clicking a picture with it. Well, the movie is doing good business and all we can do is hope that it sends a good message to the audience and breaks all the stereotypes, as it is a very good step in the support of feminism.